Teacher & Administrator Recognition Program!!! 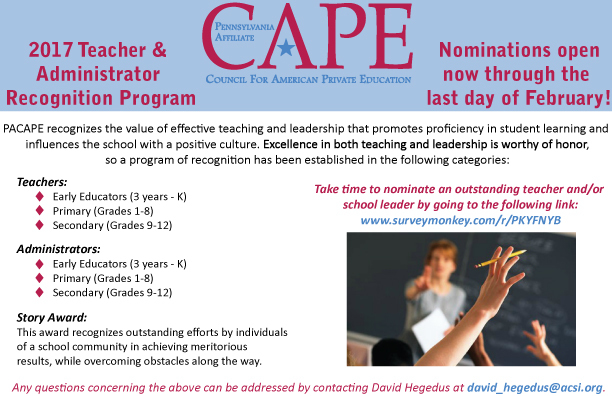 Take time to nominate an outstanding teacher and/or school leader, by going to the above referenced link on this page. Please Note: Nominations must be made by the last day of February! Read more about Teacher & Administrator Recognition Program!!! Threat Extinguisher has been working with schools to help provide additional security through practical systems. See the attached flyer for additional information. Speaker of the House Mike Turzai - 2018 School Choice Champion! LANCASTER (Jan. 19, 2018) – The Honorable, Mike Turzai, PA Speaker of the House and Candidate for Governor will be awarded the PACAPE School Choice Champion award at a ceremony beginning at 9 a.m. Friday, Jan. 26 at the Willow Valley Resort in Lancaster. Speaking at the event will be leaders from the Pennsylvania affiliate of the Council on American Private Education, in addition to the awardee. About 350 private school administrators are expected to attend. Read more about Speaker of the House Mike Turzai - 2018 School Choice Champion! Senator Mike Folmer - 2017 School Choice Champion! LANCASTER (January 20, 2017) – Private School leaders in Pennsylvania honor Pennsylvania Senator Mike Folmer for his support of school choice on Friday, January 27. The Pennsylvania Council for Private Education (PA CAPE) will present the School Choice Champion Award to Senator Mike Folmer on behalf of Pennsylvania Private Schools. The event will be held at the Willow Valley Double Tree Resort in Lancaster on January 27 at 9:00 am during the Association of Christian Schools International Northeast Regional Administrator Board Conference. Read more about Senator Mike Folmer - 2017 School Choice Champion! EITC Birthday Party - Capitol Building, May 10th at noon. On March 20, U.S. Secretary of Education Betsy DeVos met with the CAPE board of directors and representatives of the state affiliates for the first time; she reaffirmed her commitment to expanding educational opportunities for children and parents. “We have to stay focused on what’s right for kids,” said Mrs. DeVos, sounding a recurring theme in her young administration. “If we can keep asking ourselves the question about what is right for individual children, I think we’re going to come to a good and reasonable answer.” Mrs. DeVos said one of her priorities was to advance parental choice in education in a significant way that would “help parents and children who are trapped all too often in places that don’t work for them.” But she also said her immediate goals are to successfully steer the implementation of the Every Student Succeeds Act and to get her team of senior officials on board. Beyond that, she wants to advance the public policy conversation about higher education and lifelong learning. To read more about this meeting with DeVos and to take a look at the meeting CAPE had with House Education Chairwoman Virgina Foxx, take a look at the April edition of CAPE Outlook. 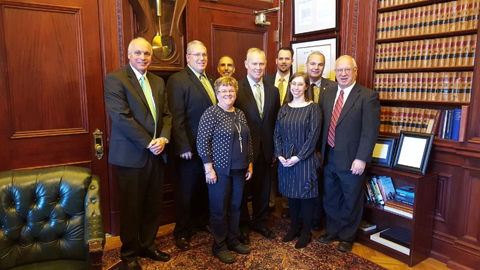 On March 22, 2017, a coalition of private school administrators and the PA Family Institute met with state representatives to thank them for their continued support of EITC/OSTC programs. Meetings were held with sponsors of the legislation, the House Majority leader, the Speaker of the House and others. ACSI PA leaders were able to share first-hand accounts of how this program has made a differnece in the lives of students and families across the Commonwealth. Additionally, pleas were made on behalf of pending proposals for ESAs (Educational Savings Accounts), a program which, if passed, will enable many families to have more of a choice in the education of their children. Finally, we were able to continue the dialogue of reminding our legislators that any new legislation dealing with education in the Commonwealth needs to continue to allow schools with specific mission-statements to continue to both hire employees who support the mission and operate the school according to the mission. These meetings are crucial as nothing has more of an impact on legislators than hearing from their constituents in person. It requires time away from the office, but it is a worthy and necessary investment for the good of school choice and religious liberty. With a strong bi-partisan vote of 147-39, House Bill 250 cleared its first hurdle: passage in the Pennsylvania House of Representatives. The measure proposes to increase Educational Improvement Tax Credits (EITC) by $50 million (raising it to $175 million) and Opportunity Scholarship Tax Credits (OSTC) by $25 million (raising it to $75 million). LANCASTER (January 20, 2017)– Private School leaders in Pennsylvania honor Pennsylvania Senator Mike Folmer for his support of school choice on Friday, January 29.